I am making beds for my garden and am using treated wood with steel bracket like things. I need to make holes in them and the wood. I am doing 12 of these beds, what bit will hold up and cut through both the wood and steel. I thought I might as well convert my Comment above seeing as nobody else posted an Answer specifying the exact bit type. The bit you're looking for is a twist bit which perhaps you already have? These days they're commonly available in three finishes, bare steel, black oxide and "titanium-coated" (more accurately, coated in titanium nitride). Most bare steel bits will be HSS, short for high-speed steel, a hard and durable alloy that is highly resistant to softening at high temperatures. Both of the other types can be HSS under their respective coatings too. It's still possible to buy carbon-steel twist bits today, especially if they're very cheap. The durability of these bits when boring into steel can be low, especially if heat is allowed to build up during drilling (this can literally cause a bit to go blunt the first time it's used — if the tip goes blue it got too hot and will have 'lost temper', becoming little harder than the steel brackets you're drilling into). When preparing to drill into the steel a centre-punch must be used first to put a dimple into the metal. This is to to help prevent the tip from wandering, but even so some care must be exercised to keep the bit on the mark before it starts to cut and form its own hole. Even though HSS is very heat-tolerant you may need to lubricate periodically during drilling (e.g. with 3-in-One or motor oil, fresh or unused) to prevent buildup of excess heat. The steel may drill much more slowly than you're used to but don't press hard to get the bit to pierce it, as always it's best to let the tool do the work at its own pace. Once the bit has gotten through the steel and enters the wood expect it to suddenly increase its boring speed, so be prepared for this as the drill may jerk which always comes with the risk of a snapped bit. Wearing eye protection is advisable, and especially if doing the drilling indoors ear protection too (common foam earplugs are fine for this level of noise). As it was said in the comments you are going to need a HSS (High Speed Steel) drill bit which just means that the drill bit is extremely hard and resistant to heat. There are also titanium HSS bits which are just covered with a titanium oxide but then you wouldn't be able to sharpen them if you ever needed to do so. It sounds like for what you are doing the HSS bits would be fine for drilling through the metal and wood but depending on the materials you may want to look at a step bit such as this but I doubt that would be necessary. 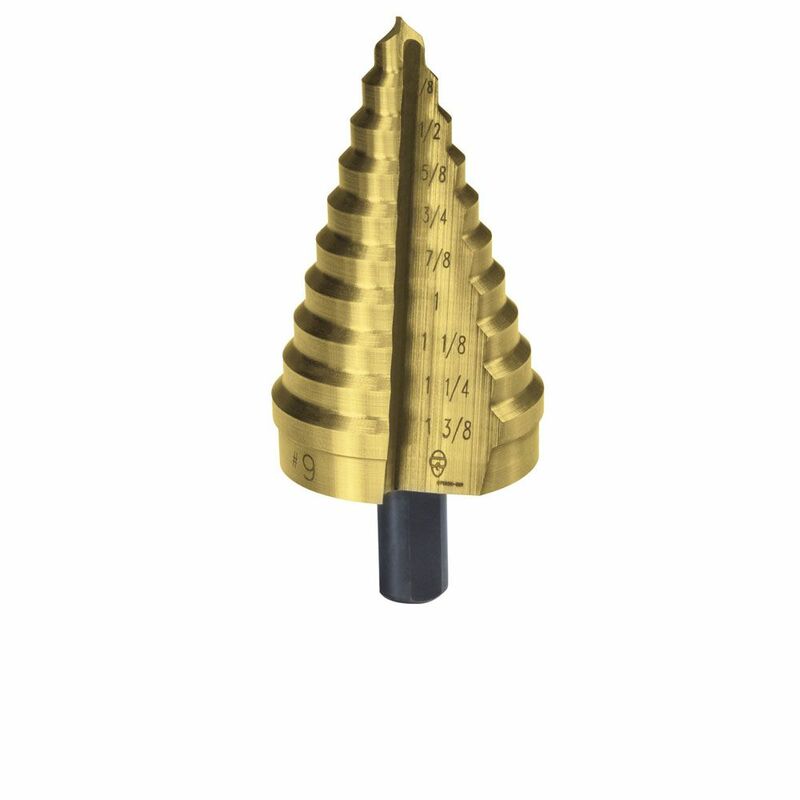 Edit: To add on to what I said before, step bits are a good choice of drilling if you are only drilling sheet metal or metal that is relatively thin (1/8" -1/4"). Also when drilling metal at anytime to counter the extreme heat generated you are going to want to use a lubricant such as motor oil or just look up "metal drilling lubricants" into google and you will find many available for purchase that are more specific to metal drilling.